From a simple Rev-a-shelf half moon lazy Susan to a top of the line Rev-A-Shelf wire rack system. If you have a corner cabinet in your kitchen you know how frustrating it is to access the blind corner cabinet. We have the blind corner systems to suit your needs and take back that dead corner we also offer other kitchen organizers to make your life easier. 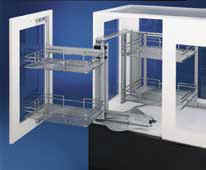 Our rev a shelf kitchen organizers and corner cabinet storage shelves get help you organize your life and your kitchen. Shelves that slide doesn't just have pull out shelves to help organize your life. We also offer kitchen organizers from rev a shelf. One type of kitchen accessory that we offer is storage shelves for a blind corner cabinet. If you have that dead corner or blind corner cabinet in your kitchen you know how hard it is to access. We can help!!! If money is no object or you really need that space the premiere corner blind corner base system is for you. This system may cost you up to $700, but it can open up that corner and turn it into useable space. See the details of the minimum cabinet size in our on line store. One set of shelves pull out when you pull open the door. Then you swivel the door and a second set of shelves come out of the corner and within reach. So you say you are not made of money or that no space is worth $700. Well you should see our half moon lazy susans from rev a shelf and other lower cost systems. These Rev-A-Shelf Lazy Susan's come in a variety of sizes. Some just pivot, others pivot and slide. I am not going to lie and say this is the best use of space. A round peg in a square hole is not going to be a perfect system for space recovery. However the cost of these lazy susan's are a heck of a lot better than the premiere system. With the proper size lazy susan for the proper size cabinet you may be able to use that wasted space again. Take a look at our store and let us know what you think. We want to help make your life easier. If you don't have a corner cabinet in your kitchen then you should thank the women who designed it!